This secure and spacious 8-sleeper house is situated in the prime position in the prestigious Oak Lane Estate and offers excellent views and access to fishing. All rooms are tiled and have undertile heating. The lounge and dining area is open plan with a fireplace for those chilly winter evenings. Double folding patio door enables the patio and lounge area to double in size for those great sunny days giving a lovely view overlooking the dam and koppie. DSTV is available. The patio has a built in braai and patio table and chairs providing the opportunity to have family meals enjoying the view. Adequate hooks ensure that fishing rods are within easy reach but out of harms way. The kitchen is fully equipped with microwave, fridge/freezer and full stove, and all the utensils for modern living. 2 bedrooms each with king size beds, en suite bathrooms comprising oval bath, deluxe shower, washbasin in marble top, and toilet. 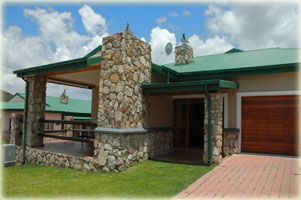 2 bedrooms each with two 3/4 beds, en suite bathrooms comprising shower, washbasin in marble top and toilet. 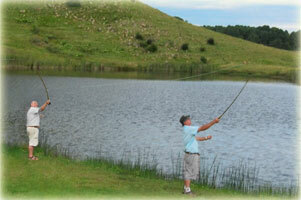 Access to the fishing is a few steps away with fishing permits in the house. Please ensure that your permits are worn at all times while fishing. Built in braai on patio. Please supply your own firewood and charcoal. Undertile heating in all rooms.